Facing the bus, turn right and walk around the back of the bus stop to explore the campus, as you learn more about the rough road to integration. The giant statue of King Lear in front of the Performing Arts Center seems to hang his head in shame over the past. Walk toward the library. Stroll beneath the live oak trees, perhaps sit on a shady bench, and watch the squirrels scamper around the commons. You may find it hard to believe the hateful behavior that took place here - some from students, some from adults. At a 2013 panel discussion, members of the 55 recalled various forms of harassment that continued long after the first days of school. Included in these memories are white students surrounding black students and yelling racial slurs, cherry bombs being thrown at them, and worse. Janice Coleman-Sawyer, one of the 55, recounted an incident that occurred in the old airplane hangar. Because the cafeteria remained a segregated part of LSUNO’s campus, the hangar became the black students’ de facto hang-out. To hear Coleman-Sawyer’s story, see the first video below. Harold Fontennette, pictured below, also remembered that white students would throw firecrackers in the hanger as the black students ate. He describes: ”They would go pop, pop, pop, and it sounded like somebody was shooting at you. We would jump under the tables." Not even the classroom provided a safe haven. Arnolie recalled students placing tacks on the seat of her desk, and teachers getting in on the act. Members of the 55 told stories of their names not being called during roll; teachers telling them they had failed an assignment, but refusing to return the graded paper; and some instructors being openly hostile. Hear more of these stories in the second video below. 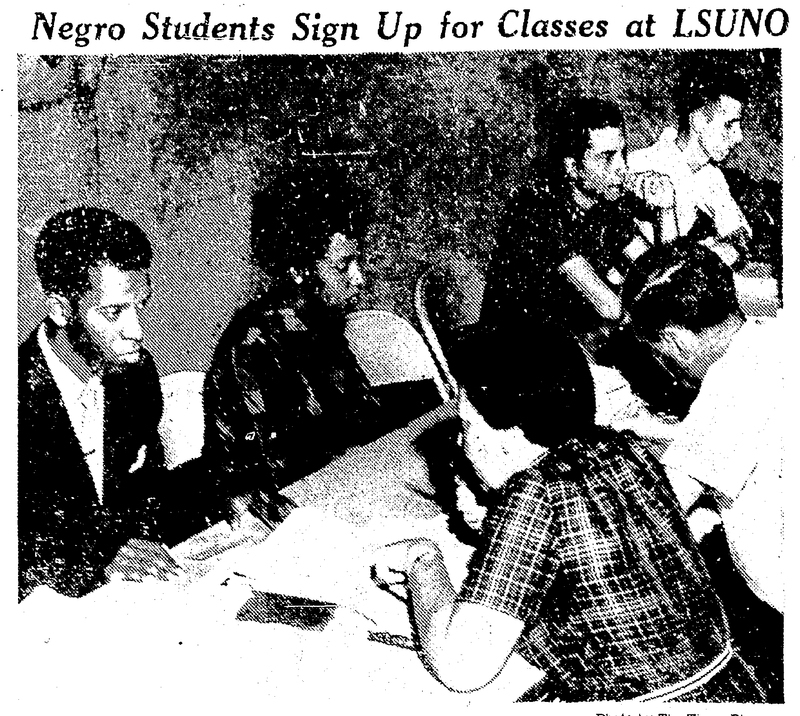 Registering for the future: This photo, which appeared in The Times-Picayune, shows Harold Fontenette and Josephine Eli, the first two black students who registered for classes at the new LSUNO. 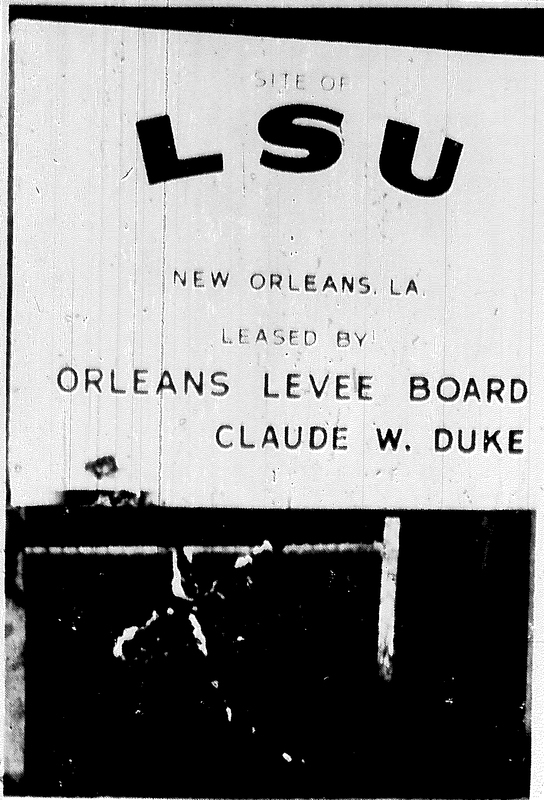 ~ Source: The Times-Picayune, Sept. 10, 1958. Burning Hatred: Although it is difficult to see at the bottom of this old photo, a cross was burned at the main entrance to the new LSUNO campus the weekend before the school’s first classes began. ~ Source: The Louisiana Weekly, Sept. 20, 1958. 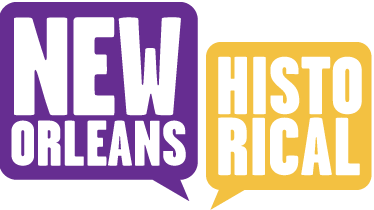 Becky Retz, “Explore the Campus,” New Orleans Historical, accessed April 24, 2019, https://neworleanshistorical.org/items/show/817.